New York Law School's curriculum systematically integrates theory and practice. The traditional study of legal doctrine and institutions is always measured against the perspectives of legal practitioners. Fusing these perspectives gives the Law School's graduates an extraordinarily rich and strong basis on which to build a productive, responsible, and rewarding life in the profession. New York Law School, a private institution in lower Manhattan, prides itself on pro­viding hands-on training to yield lawyers who pass the bar exam and who are “ready to make an impact on the legal profession.” The program has a heavy focus on practical courses and offers “many opportunities to take part in real lawyering while you are still in law school” through coursework as well as externships. There are plenty of opportuni­ties to tailor your program to fit your professional needs with 250 elective courses offer­ing a host of specialized areas of law. 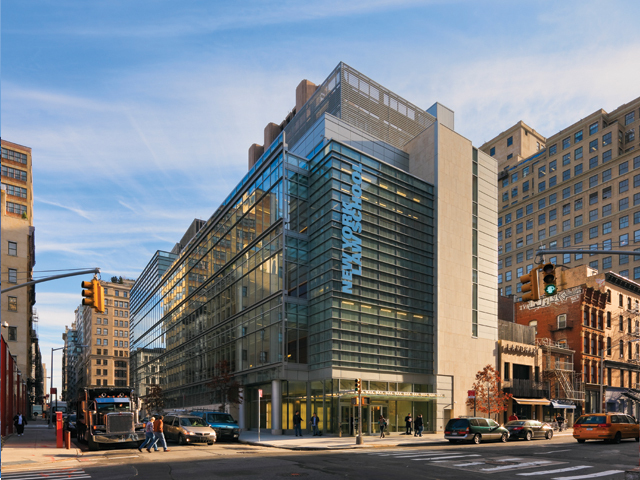 The NYLS campus employs “state-of-the-art facilities in a prime location of New York City. There are numerous courthouses within walking distance and students are encour­aged and sometimes required by professors to see the law in action first-hand,” says a 1L.The faculty at NYLS brings talent and expertise to each program making classes a pleasure. “Professors and deans make themselves accessible at all times, eager to help students in any way that he or she can, friendly in the hallways, want to get to know the student body,” beams a 2L. “The professors here actually care. They want their students to learn the law and join the legal field as competent and well trained lawyers. They focus less on theory and more on the challenges that we will face in practice. This is great, because most of us are here because we want to be practicing attorneys. For those who are interested in legal scholar­ship, the Law Review is a great way to get involved. Professors are generally more than happy to meet with students to give guidance on school, careers, and anything else,” says one student.“The assistant dean and registrar Oral Hope, is incredibly dedicated to his job and has more than once helped me organize a perfect class schedule. Professors are usually well qualified and like conveying their knowledge. They are also very accessible” says a 2L.Some students are not as satisfied with the administration, charging that it can be “unavailable and hostile to criticism.” Most students, however, view the management team as “present and very accessible to students,” as well as “very responsive to stu­dents’ needs.” As of June 2012, NYLS welcomed a new Dean and President, a new Associate Dean for Academic Affairs, and a new Associate Dean for Career Planning.The classes at NYLS may not be suited for students seeking small classes and indi­vidual attention. Many students cite classes as being “seriously overcrowded.” When it comes to career services offered by the program, reviews are mixed. Some prospective lawyers on campus say that “career opportunities for students outside the top tier seem to be few and far between.” “Getting into prestigious law firms is extreme­ly difficult, and recruitment at NY Law is terrible.” Of course students at the top of their class view things differently, reporting that “it’s not difficult to get a big firm job here in NYC.” Citing the “huge network of practicing alumni” who hold positions at big name organizations in government, public interest, and firms of all sizes as their defense.“Like most things, law school is what you make it. NYLS has an enormous amount of resources available if one sought them out. If the school does not have something, they are willing to reach out to other institutions on your behalf. I have had the privilege of working with professors outside of the classroom, which has enabled me to further tap into the resources at NYLS,” retorts a 2L.Despite being a smaller campus, the facilities are impressive. Newer buildings are outfitted with state-of-the-art amenities, including “brand new classrooms, lounges,” study rooms, and a new library. “The classrooms, library and building in general are state of the art. Wireless internet and wireless printing is accessible everywhere in the building. The classrooms are designed in such a way that you can always see and hear the professor,” adds a 2L. JD/MBA with Baruch College 4 years of full time course load or 6 of part time course load. JD/MA in Forensic Psychology with John Jay College of Criminal Justice, CUNY. JD/LLM in Taxation and JD/LLM in Real Estate, JD/LLM in Financial Services Law, 4-to-5 years. 3+3 BA/JD with Stevens Institute of Technology, 6 years. Guaranteed admission program with Montclair State University. Want more info about New York Law School? Get free advice from education experts and Noodle community members.